I got my results from the AncestryDNA test, which offered a few surprises and a few non-surprises. 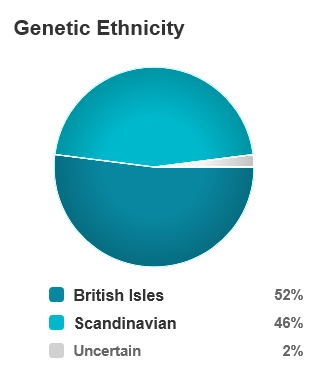 In brief: my DNA is 52% British Isles (England, Ireland, Scotland, Wales), 46% Scandinavian (Norway, Sweden, Denmark), and 2% uncertain (but still Earth, presumably). What can I conclude from these results, which look back “hundreds—perhaps even thousands—of years ago” (according to the report)? Not surprising—British Isles: I was expecting to see a British Isles heritage. Three of my great-grandparents were born in the British Isles (Ireland in particular). Another four are known or strongly suspected to have English ancestry. That leaves only one great-grandparent with no known British Isles ancestry. I could have had a very high percentage of DNA matching the British Isles. Conclusion—British Isles on both sides: The fact that I’m more than 50% British Isles proves that both of my parents have this ancestry. If one of my parents never had this in their heritage, my British Isles percentage couldn’t have been more than 50%. I can’t tell how much I got from which parent, but I can be certain I got some from each. Surprising (at first)—only 52% British Isles: With a British Isles heritage in 7 of 8 great-grandparents, why is my British Isles DNA “only” 52%? That was surprising at first, because 7/8 = 87.5%, but that’s now how DNA works. You get half of your DNA from your father and half from your mother, but you don’t know which half each parent contributes. Each child gets a different DNA mix. The half of my father’s DNA I received could have included very little of his British Isles DNA, or lots of it. Likewise for my mother. In other words, having 52% British Isles DNA is completely plausible. Surprising—Scandinavian: Where did I get 46% Scandinavian DNA? Looking back through the last several generations, I don’t find a single Scandinavian in my family tree. I have some far-reaching branches of the family tree that find Scandinavians born over 1100 years ago, but a) there are some iffy genealogical connections between now and then, so I’m not entirely certain they belong in my family tree at all, and b) if I have to go that far back to find any Scandinavians, it seems unlikely that almost half of my DNA would be from IKEA. Conclusion—got Scandinavians: I’ve probably got Scandinavian ancestors I don’t know about, probably within the last 1000 years. I could have gotten all of my Scandinavian ancestry from one parent, because it’s less than 50%, but the test doesn’t tell me how much came from one parent or the other. Possibly, the Scandinavian connection is a false positive, meaning it’s a mistake in the AncestryDNA data and I don’t have Scandinavian ancestors after all, but I’m not going to assume they blew it without further evidence. Surprising—no German DNA:The DNA results didn’t show any German ancestry. The Becker surname is German. My Becker great-great-grandfather and his wife were born in Germany, and so were their parents. (To be precise, my great-great-grandfather was born in the Grand Duchy of Hesse — Großherzogtum Hessen in German — before there was a Germany. It was part of what would become Germany.) Why don’t I have any German DNA? Conclusion—lack of German DNA is not a lack of German ancestors: Does my lack of German DNA mean I don’t really have German ancestry? No. This sort of DNA testing can prove what’s present in your ancestry, but it can’t prove what’s missing. My German great-great-grandfather Valentine Becker married Anna, a woman who was probably German. Their son Edward probably had lots of German DNA. Edward married Ethel, a woman with no known German ancestry. Their son Lester probably had 50% or less German DNA. Lester married another non-German, Mary. Their son Earl (my father) could have anywhere from 0 to 50% German DNA. Dad married a non-German too, so it’s completely plausible that I received no German DNA despite the fact that I have German ancestors. Not surprising—my cousin is my cousin: The AncestryDNA site says my cousin Ellen appears to be my cousin! Our mothers were sisters, after all, and Ellen did the test too, so this accurate AncestryDNA match lends credibility to the results. Surprising—my cousin is just like me: The AncestryDNA match say Ellen is 54% British Isles and 46% Scandinavian — very close to my results. We’re first cousins, so some DNA overlap is possible and likely, but I’m surprised our results were that close. Two of my grandparents have no connection to two of Ellen’s, so I would have expected some non-matching elements too. Speculation—Scandinavian on Mom’s side: The similarity of our results raises the possibility that our Scandinavian DNA came from the grandparents we have in common. It’s something to pursue, but we’ve hit some genealogical dead ends in that part of the family, so I’m not sure how we’re going to solve this puzzle. However, it’s also possible that our Scandinavian DNA is a coincidence, if Ellen’s father and my father just happened to have Scandinavian ancestry, even though they weren’t related. It’s also possible that we each got a mix from both parents. Basically, while the Scandinavian ancestry could be in our common ancestry, it might not be. This AncestryDNA test is in particular an autosomal DNA test (atDNA). A few years ago, I did the mitochondrial DNA (mtDNA) test and the Y chromosome (Y-DNA) test. The mtDNA test placed my maternal line in Haplogroup H, which showed up in Europe during the Stone Age. This group spread all over Europe. The Y-DNA test looks only at the paternal line, and it put my paternal line in Haplogroup R1b, which also came to Europe from western Asia during the Stone Age. They wound up all over western Europe and the British Isles. The results are consistent. Based on the mtDNA and Y-DNA tests, which look back tens of thousands of years, it’s no surprise that the atDNA test, which looks back centuries instead of millennia, found European ancestry. It’s official: I’m European-American. I finally took the Pandora plunge. My results have been mixed. I’ve created four stations so far, liking and disliking my way through the selections Pandora picked out for me. Me: Hi, I’d like a pair of shoes similar to the ones I’m wearing now. Pandora: Okay, let me see, here’s a selection of shoes that are similar in style, color, or brand. Me: Good selection, thanks. You’ve got my business. Pandora: Okay, here, I picked out a shirt for you. Me: No, I said I want shoes — similar to what I’m wearing now. Pandora: Okay, how about this other shirt? By the way, I’d like you to meet some 50+ women. Pandora: Ah, okay. Here’s a nice pair of sandals. Me: Wrong again. I might like those when I’m shopping for sandals, but I’m not shopping for sandals. Pandora: Can I interest you in some stiletto heels? By the way, I’d like you to meet some 50+ women. Pandora: Oh, alright, here’s a pair of loafers. Pandora: Now try these on. By the way, I’d like you to meet some 50+ women. Me: That’s a pack of cigarettes. Pandora: I’m sorry, you’ve turned down too many things already. Right now it’s the cigarettes or nothing. Come back another day and we’ll do this again. By the way, I’d like you to meet some 50+ women. Tylman Susato Radio: Renaissance music, including people like, hmmm….. Tylman Susato. Leo Kottke Radio: Kottke is an astounding guitarist, mostly acoustic, who blends folk, country, blues, jazz, and classical guitar into his own distinctive sound. The most frustrating station is my “Frank Zappa” station, which I’m tempted to rename to “Frustration Station.” First, Pandora decided that what I really wanted was lots and lots of Led Zeppelin and Jimi Hendrix — not what I want if I feel like listening to Zappa. Eventually, it decided that what I really wanted was lots and lots of King Crimson — also mostly not what I felt like listening to if I was after a Zappa sound. Currently, it hasn’t completely let go of its King Crimson obsession, and it has latched onto Jeff Beck. I like a lot of what Jeff Beck has done, but it’s not always what I’m after on this station. Pandora still slips in the occasional Frank Zappa or those with somewhat similar sounds (as if anybody really sounds like Zappa), but I might give up on the station if it doesn’t shape up. 6 + 1 x 0 + 2 / 2 = ? It’s 7. It’s not 1, or 0, or 5, or 3.5, or any of the other answers people have imagined. This has been going round and round on Facebook, with over 300,000 responses last time I looked. Sadly, most of the answers are wrong. There’s a thing called order of operations. Arithmetic isn’t a matter of opinion or voting. There’s a memory aid — Please Excuse My Dear Aunt Sally — to help one remember the right sequence: parentheses, exponents, multiplication and division, addition and subtraction. Multiplication and division: 1 x 0 = 0 and 2 / 2 = 1. Now, our exotic puzzle becomes 6 + 0 + 1. Addition and subtraction: 6 + 0 + 1 = 7. My iPhone’s calculator app comes up with 7 because it uses the proper order of operations. The calculator app on Windows 7 comes up with 7 because it also uses the proper order of operations. However, I’ve seen cheap calculators that use the wrong order of operations. They act like everything is from left to right, no matter what. You enter 6 + 1, and they immediately show 7. Multiply by 0 and you get 0. Add 2 and you get 2. Divide by 2 and you get 1. I imagine this is why 1 is a popular answer, when people assume all arithmetic is strictly left to right, or they’ve been misled by a stupid calculator. Here’s an illustration of why multiplication and division come before addition and subtraction. Let’s say I’m counting my cookie intake over the last month. On 5 occasions, say I had 3 chocolate chip cookies: 5 times, 3 cookies, or 5 x 3. On 3 occasions, I had 2 oatmeal raisin cookies: 3 times, 2 cookies, or 3 x 2. 5 x 3 + 3 x 2 = ? Do you think I had 21 cookies, or 36 (or some other number)? The correct answer, certainly, is that I had 21 cookies: 5 x 3 = 15 chocolate chip cookies, plus 3 x 2 = 6 oatmeal raisin cookies, for a total of 21 cookies. If you do the arithmetic in the wrong order, like strictly left to right, you’d think I had 36 cookies. 5 times, 3 cookies = 15 so far. 15 cookies + the 3 times I had oatmeal raisin = 18 cookies so far. (Makes no sense now, right?) 18 cookies, times 2 for the two times I had oatmeal raisin = 36. Wrong! If you think 5 x 3 + 3 x 2 = 36, try laying out pennies. Take 5 sets of 3, and then 3 sets of 2, and then count how many pennies you’ve laid out. You’ll get 21, not 36. Or say the problem in a different order, oatmeal raisin before chocolate chip. 3 times, I had 2 oatmeal raisin cookies. 5 times, I had 3 chocolate chip cookies. 3 x 2 + 5 x 3 = ? If you follow the proper order of operations, you’ll find that I had 21 cookies, same as before. If you pretend arithmetic always runs left to right, you get a different answer this time: 3 x 2 = 6, 6 + 5 = 11, 11 x 3 = 33. If strict left-to-right arithmetic was correct, then I had either 36 or 33 cookies, depending on which cookies you count first. Does that convince you? You go to a vending machine. The item you want costs 75 cents. You put in 2 quarters, 2 dimes, and a nickel. Does that add up to 75 cents? Only if you follow the correct order of operations. 2 x 25 + 2 x 10 + 1 x 5 = ? The correct order of operations has us do the multiplications before the additions: 2 x 25 = 50, and 2 x 10 = 20, and 1 x 5 = 5. Then we add up 50 + 20 + 5 and get 75. If you think arithmetic is only left to right, you’d get 2 x 25 = 50, plus 2 = 52, times 10 = 520, plus 1 = 521, times 5 = 2,605. Which is it? Do you think 2 quarters, 2 dimes, and a nickel add up to 75 cents, or $26.05? Now switch the order. If you take those same coins, but you put in the 2 dimes, the nickel, and then the 2 quarters, is it still 75 cents? 2 x 10 + 1 x 5 + 2 x 25 = ? Of course it’s still 75 cents. The correct order of operations says so: 2 x 10 = 20, and 1 x 5 = 5, and 2 x 25 = 50. Then 20 + 5 + 50 = 75 cents. If you use left-to-right order instead of the correct order: 2 x 10 = 20, plus 1 = 21, times 5 = 105, plus 2 = 107, times 25 = 2,675. You’d think you had put $26.75 into the machine this time, instead of $26.05 when you started with the quarters. If you believe your two quarters, two dimes, and one nickel add up to 75 cents in any order, you just made a case for using the correct order of operations. In short, the GPS means you build up enough evidence to say that this is probably true, and the alternatives probably aren’t. It’s not proof beyond all reasonable doubt, but it’s stronger than saying something is merely plausible or that you hope it’s true or you think it’s true. The problem with the quotes that keeping getting attributed to Albert Einstein, Abraham Lincoln, and others is that they miss on all counts, just like the lesser genealogical contributions posted online. Take the insanity quote. I’ve been unable to find any verifiable source for the quote. I haven’t found any original sources. I haven’t found anyone who said, “It’s in this book/paper he wrote, which you can look up; see page x.” Nobody has said, “He said it during an interview held on mm/dd/yy, and a transcript/recording is available.” Nobody has said, “It’s in this letter he wrote, which has been verified, and here’s where you can find the letter.” Whether or not my search for a source counts as reasonably exhaustive, I haven’t uncovered a single source that someone could look up. So far, assigning the insanity quote to Einstein falls short of the mark for the first three of the GPS guidelines. How about conflicting evidence? Sometimes, the insanity quote gets attributed to Ben Franklin, and sometimes to more recent figures. Take a look at the discussion on the Benjamin Franklin Wikiquote page. For the insanity quote, conflicting evidence about who said it is at best unresolved, and maybe even tilted away from Einstein. This falls short of the mark for the fourth GPS guideline. Without hitting the first four guidelines, I can’t offer up the fifth: a “soundly reasoned, coherently written conclusion” that claims Einstein is the source of that definition of insanity. An additional element of genealogical research that’s useful outside of genealogy is evaluating the quality of a source. The merest rumor or vague recollection can be a source, but they’re not very good ones. A low-quality sources gives you something to check out if it seems plausible, but it’s not strong evidence. The best genealogical sources were created at the time by someone who was present and well-informed, like a marriage record created at the time. The worst genealogical sources were created long after, by someone who wasn’t there, who got the information from someone else who wasn’t there; the focus is often more on what sounds cool than on what’s accurate. Lots of the Einstein quotes getting passed around online are like the worst genealogical sources. I don’t want to add to the flood of misinformation on the Internet. I don’t like passing around rumor as truth. The ability to draw a sound conclusion is terribly important in the world today, so I’m disappointed when I see a disregard for accuracy, even on something as mundane as a good one-liner. Or look at it this way: if you were playing a trivia game, it’s the difference between right and wrong … unless the trivia game itself did a sloppy job of verifying its answers. Serving as the executor of my parents’ estates has brought to mind things I wish my parents had done and things I’m glad they did. Make a will! You should have a will if you have kids, property, or a life partner of any sort, or if you want to control who gets what, or if you can fend off potential squabbles among your heirs. Find at least two people who’ll agree to be your executors: a primary and at least one backup. Sign your will in front of a notary and two witnesses who won’t inherit anything. Make a new will if you’ve had family status changes since the last one, or if your kids were minors in the last will but they’re not minors now. Register your will with your county Register of Wills. It doesn’t cost much, and it becomes an official copy your executor can retrieve readily when you’re gone. Gather your records so your executor can sift through them. Even a few clearly marked boxes like “Insurance Policies” or “Tax Returns” will be better than nothing, even if the boxes are a disorganized mess internally. List your accounts (bank accounts, loans and mortgages, investment accounts, utilities, credit cards, phone, Internet, cable, etc.) so your executor can handle notifications, final payments, and so on. List your insurance policies so your executor can file the appropriate claims. List your main assets like property, vehicles, and valuables: not just what they are, but also where they are and how to retrieve them. List anyone who should be notified of your demise. This could include healthcare providers, accountants, your kids’ schools, religious organizations, clubs, relatives, and friends. You could list newspapers where you want your death notice to appear. List your social networking sites: Facebook, Twitter, LinkedIn, or any other site where your executor would need to announce your death or close down an account. More on this below. Important: Protect the above lists. Don’t open yourself up to identity theft. There’ll be a lot of PII (Personally Identifiable Information), maybe some PHI (Protected Health Information), and certainly some TMI (Too Much Information, stuff that most people shouldn’t know about you). Don’t send sensitive info by email. (Note that your bank won’t email your account details to you, even with your permission.) Maybe you’ve got a fireproof, waterproof safe or lockbox at your house where you can store paper copies. Maybe your executor has one. Maybe you’re using a secure web-based storage site where you can keep these things (more info below). Check with your bank to see if you can let your executor get to your safe deposit box. You might be tempted to store your lists on the electronic storage media du jour, like CDs or USB flash drives, but you may well outlive the currently popular storage media. Important: Tell your executors where to find the above stuff. Your executor will need to know where to get all this info. Because I’m also an IT kind of guy who’s also steeped in information security matters, I offer some technological tips below. In general, contact the site’s customer service to find out what your options are. Typically, you’d need to provide evidence of death (copy of a death certificate or a newspaper death notice) and evidence of your right to speak for the deceased person (letter of adminstration identifying you as the executor). Some sites will just close down the account, some will grant you access, and some – like Facebook – will let you create a memorial page. Facebook lets you report a deceased person’s Facebook profile, which you can remove or turn into a memorial page. You won’t get the person’s Facebook password. Google can give you access to a deceased person’s Gmail account. Google makes no promises, though, so there may be situations in which they won’t grant you access. Talk to Google’s customer service people if you also want to get access to the person’s other Google services (Google Docs and so on). Twitter lets you deactivate a deceased person’s Twitter account. You won’t get the password though, so you won’t be able to create a memorial Twitter page along the lines of Facebook’s memorial page. Similarly, LinkedIn lets you deactivate a deceased person’s LinkedIn profile. The profile will be removed, not turned into a memorial. A secure, Internet-based location for your valuable information is certainly tempting. You can get to it from anywhere you have web access, and you can tell your executor how to get to it if you pass away. However, consider two things. First, who’ll live longer, you or the online service? If you expect to be around for another 30 years, for example, will the online service be around that long? (Go ask deathclock.com how long you might live.) Note that if the company goes into Chapter 7 bankruptcy, it immediately ceases operations, without advance notice to you, and all its assets are turned over to a court-appointed trustee for auction. Second, the companies providing these services aren’t banks. While it’s in their best interests to protect your data, a number of these online services are new or small companies that might not have lots of resources to put into data security. They offer up a secure web site, which is a good thing, but they might not have the staff time or the facilities for the best prevention, detection, and remediation of security breaches. “Encryption better than a bank’s” is a somewhat misleading advertising claim. But if you take this path, you can go with an “online undertaker” service, or you can set up a more general cloud-based storage system. Three “online undertaker” services appear to own the market: Legacy Locker, Asset Lock, and DeathSwitch. These services let you store the kind of info I listed above, including lists of online accounts and passwords. When the “inheritance” is triggered, the beneficiaries get access to what you stored for them. As I mentioned earlier, notifying an online service can result in the account being closed down and the contents deleted. These online undertaker services, however, simply let your beneficiaries use your accounts as they are now. Legacy Locker has free and paid services. You can identify beneficiaries for each “asset” you store. Your executor follows the notification process, and then your beneficiaries receive what you stored for them. Asset Lock lets you store the same kinds of info. Notification is different, because a number of “Recipients” (you choose the number) must log in and confirm that you’ve died. That method doesn’t sit so well with me, because nobody is presenting direct evidence of your death, and it works only if the requisite number of recipients are savvy enough and responsible enough to carry out the task. Deathswitch takes yet another approach. You store the same sorts of info, and you tell it how often to check on you (daily, yearly, whatever). It checks on you by sending you email asking you to verify you’re still there. If you don’t respond, it sends out the notices you established previously. What if you stop using that email address? What if it gets spam filtered? What if you go away for a while (vacation, sabbatical, coma) and miss out on the messages? You’ll get a notice too, but it seems it’s up to you to notice the notice, and log in to Deathswitch to say you’re not actually dead. The problem is that if you weren’t seeing the check-in messages in the first place, you probably won’t see the notice that announces your death. By the way, there’s another such service called Slightly Morbid, but I get certificate errors when I visit the site. Bzzzt! Next contestant! Plain old document storage sites like Dropbox and Google Docs let you store files, but there’s no mechanism for sending files to your beneficiaries. Instead, you might provide your executor with your login information so your executor can find whatever lists and instructions you’ve stored there. But really, my main piece of advice here is to make a will, and register it so there’s an official copy in a known place.